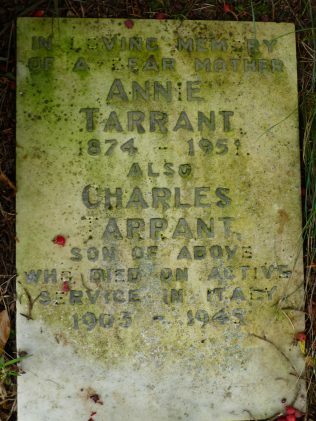 Charles Tarrant enlisted in the Sherwood Foresters (Nottinghamshire and Derbyshire Regiment) on 15th November 1892 and served in India, taking part in the North West Frontier Operations 1897-98 with the 2nd Battalion during the Tirah Campaign for which he earned the India General Service Medal. He returned to the UK on 4th April 1899 and was posted to the 1st Battalion to serve in South Africa during the Second Anglo-Boer War from December 1899 to the end of the war. He qualified for the Queen’s South Africa Medal and the King’s South Africa Medal. He returned to the UK on 3rd September 1902 and was transferred to the Reserve on 3rd September 1903. He was discharged on 14th November 1904 after 12 years’ service. He then elected to spend four years on the D Reserve meaning he could be called-up in the event of mobilization. He was finally discharged in 1908 and he became a silk tie trimmer, setting-up home at Bleak Hill in Mansfield. During the First World War he re-enlisted in the Sherwood Foresters on September 9th 1914 and remained with them in the UK until 26th May 1916 when he was transferred to the 1st Garrison Battalion of the King’s Own Yorkshire Light Infantry. Garrison battalions were raised from men too old or unfit for full military service. On 3rd November 1916 Charles was transferred to the 1st Garrison Battalion of the Prince of Wales’s Own West Yorkshire Regiment. The Battalion was sent to the island of Malta for garrison duties on 5th November 1916 and returned to the UK on 13th January 1919. Malta was not a theatre of war and was used as a hospital base for the Mediterranean and as a coaling station for ships. For service in Malta he qualified for the British War Medal. He was discharged to the reserve on 25th February 1919 and received a pension. He died of myelitis and pneumonia aged 48 on 22nd August 1920. He is buried in Mansfield Nottingham Road Cemetery. When the then Imperial War Graves Commission was established in 1917 its role was to care for the graves and memorials of those who had died as a result of ‘wounds inflicted, accident occurring or disease contracted, while on service whether on sea or land’. Charles’s service record showed he had received a pension for sickness attributable to the war, so when he died in 1920 the criteria for being given a war grave would have been met. He had married Annie Spray on 25th October 1902. They had six children, the oldest of whom was Charles born 14th July 1903. 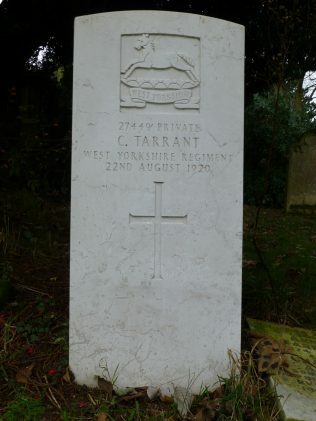 He became a craftsman in the Royal Electrical and Mechanical Engineers and died in Italy on 29th May 1945. He was buried at Bari. The CWGC says: “There was no serious fighting in the vicinity of the town, which was the Army Group headquarters during the early stages of the Italian campaign, but it continued to be an important supply base and hospital centre, with the 98th General Hospital stationed there from October 1943 until the end of the war.